PT 109 was one of the hundreds of motor torpedo boats (PT) of the PT 103 class completed between 1942 and 1945 by Elco Naval Division of Electric Boat Company at Bayonne, New Jersey. The Elco boats were the largest in size of the three types of PT boats built for U.S. use during World War II. Wooden-hulled, 80 feet long with a 20-foot, 8-inch beam, the Elco PT boats had three 12-cylinder Packard gasoline engines generating a total of 4,500 horsepower for a designed speed of 41 knots. With accommodations for 3 officers and 14 men, the crew varied from 12 to 14. Its full-load displacement was 56 tons. Early Elco boats had two 20mm guns, four .50-caliber machine guns, and two or four 21-inch torpedo tubes. 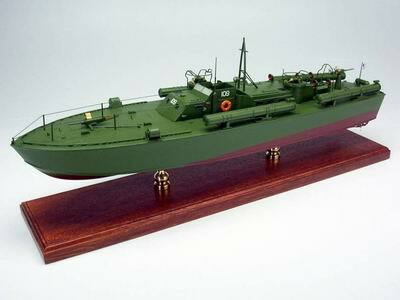 Some of them carried depth charges or mine racks. Later boats mounted one 40mm gun and four torpedo launching racks. Many boats received ad-hoc refits at advanced bases, mounting such light guns as Army Air Forces 37mm aircraft guns and even Japanese 23mm guns. Some PTs later received rocket launchers. The late US President John F. Kennedy brought the history of the PT boats to public view as he served upon PT-109 during the Pacific War. Mahogany Wood. Scale: 1/40. Length 24 inches.